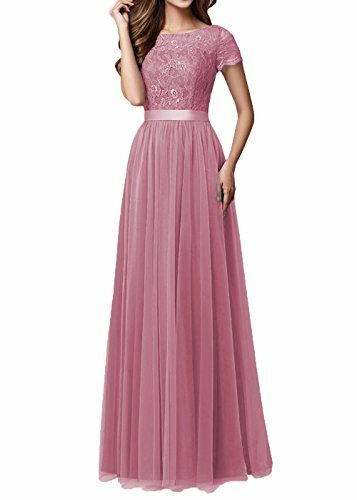 DYS Women's Lace Bridesmaid Dress Sleeves Tulle Prom Evening Dresses Long Blush US 8 by DYS Dresses at SCRHI. Hurry! Limited time offer. Offer valid only while supplies last. PRODUCT DESCRIPTION:1. Material: Tulle2. Neckline:Jewel, see through3. Sleeves:Short sleeves4. Built-in bra:Yes, can be moved if neededSHIPMENT:a. Please Confirm the Measurements Carefully before ordering. If you have problems about the size when get it, please contact us first. RETURN request can be accepted within 7 days since delivered.Thank you for your understanding. The item is flat packed when post, please iron under warm and low temperature to ease the crease. If you have any questions about this product by DYS Dresses, contact us by completing and submitting the form below. If you are looking for a specif part number, please include it with your message.